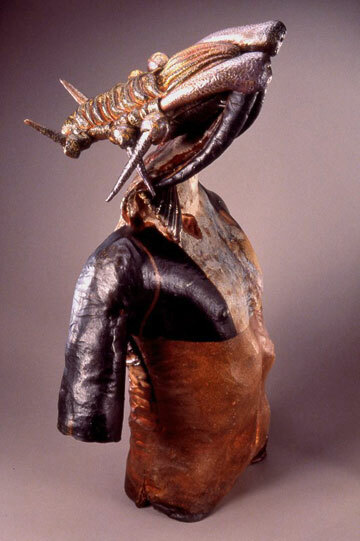 This series of sculptures represents an exploration of constructed figurative forms blending fish, insects and humans. Ranging from whimsical to serious I create compositions of known and ambiguous imagery that encourage the viewer to consider the nature of all things. Using physical features that cross through species I seek to emphasis cycles of life, evolution and interdependency. The juxtaposition of heroic human forms with fish, birds and insects is fertile ground for visual and symbolic associations. I construct these sculptures from clay and glaze, steel and adhesives, paint and pencil to utilize the versatility of mixed media.